(L to R) Bobby Farrelly, Jeff Daniels, Peter Farrelly and Jim Carrey on the set of Dumb and Dumber To. Back in 1993, Peter and Bobby Farrelly had yet to make their first movie. For some reason, studios weren't interested in a gross-out buddy comedy centered around two adult idiots on a road trip to Aspen. Ultimately, they decided to just make the movie themselves and came to Utah to shoot their debut picture, Dumb and Dumber. For 10 weeks, the cast and crew made Salt Lake City their home, filming in places like Orem, Sandy, Park City and Heber City. Unfortunately, the sequel, Dumb & Dumber To, was filmed predominantly in Atlanta. But I caught up with director, producer and writer Bobby Farrelly to talk about his time here in Utah and the pressure behind making a sequel to one of the most heavily quoted movies of all time. You must overhear people quoting Dumb & Dumber constantly. Do you get a kick out of that, or is it just annoying at this point? I do enjoy it. Like, if you're watching ESPN, you know there’s about a 33 percent chance that they'll say, "So you're telling me there’s a chance." Yeah, you hear it and you can't help but laugh to yourself because so many of those memorable lines, those weren't the ones that we thought were gonna be funny. At the initial screenings, no one was laughing at those lines. But with the repetitive viewing, they just kind of stick with you. Do people ever demonstrate "the most annoying sound in the world" to you? Oh god no. Haha, yeah, that would be terrible. A large chunk of Dumb & Dumber was shot here in Utah. What made you and your brother want to film here? Why not Aspen? We had written the story where the two guys go from Providence to Aspen, and being in Los Angeles when we wrote it, we were trying to think where could we go to shoot this that’s not Aspen. We didn't think they would let us into Aspen. And so, one of our producers said, “You know, a great place to shoot this would be Utah because it has so much to offer. It has flatlands. It has mountains. It has snow." We went and took a look and, low and behold, he was right, so we shot it all there and we had a fantastic time. I dunno, I always had a soft spot in my heart for Salt Lake City after that. It was kind of surprising for me to discover that I walk by Lloyd and Harry’s apartment almost every day on my way to work. Do you really? Believe it or not, we had to re-create that [For Dumb & Dumber To] because the guys haven't grown up at all, and they're still living in the same place, and so we actually had to rebuild it in Atlanta. It might have made more sense for us to just fly out and do it there. 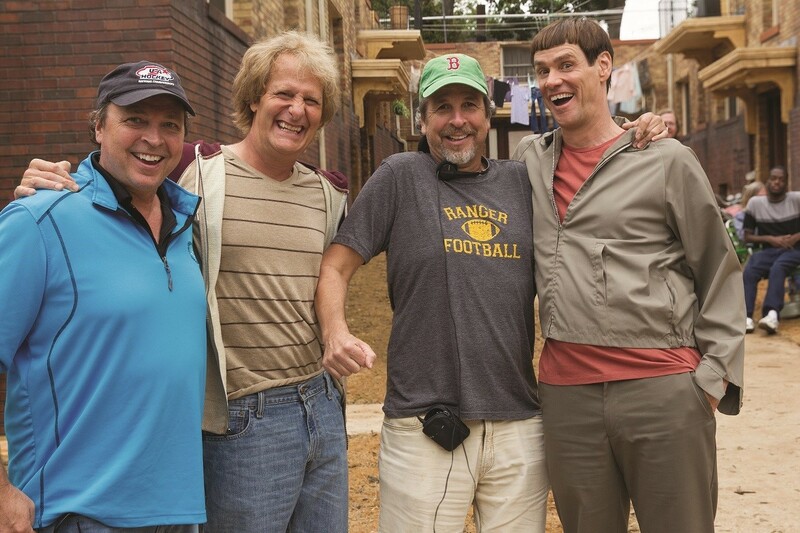 Since Dumb & Dumber was your first movie as a director, was the script a tough sell to studios? I mean, there really weren't any other comedies out there on the same level of absurdity. We got a lot of positive feedback from people reading the script and we would be like, “Can you help us to make it into a movie?" and they would hand it to someone above them. And from our experience, these people are not the funniest people in the world, particularly when it comes to words on the page. They don't see it like we see it. It just died in the chain of command and we couldn't get it made. So, we just did it ourselves. It’s been 20 years now, why bring these characters back? The studios didn't have much interest in making it for many years, and my brother Pete and I were hoping that one day we would have the chance to do it again because it sets itself up for a sequel. About five years ago, Jim Carrey—I don't think he had watched the movie since it came out—was in a hotel room watching it on TV or something and I think he got really nostalgic for how much fun we had. He called us up and was like "Guys, I just watched the movie and it brought back so many memories." So we just jumped at the opportunity. I read somewhere you spent two years working on the Dumb and Dumber To script. Yeah. We wrote the [Dumb & Dumber] script in 19 days. We had rented this little cabin in Cape Cod and we didn't come out of it till it was done, and when we eventually came out, we had a 120 page script in our hands. This one, it took about two years of writing to get to that same point. Why? Because we didn't have the freedom to just do any stupid thing we wanted to. For the first one, we were just making it up. But to write a sequel, there's certain rules you have to follow, like, Would Harry do that? Or Lloyd say this? We didn't want to make a movie that didn't make the first one proud … and it took longer because we're just older. Why do you think some of the fans of the original are so worried about this sequel? I don't feel that pressure because we are so happy with it. I know there’s a generation of kids who grew up with this movie and know it very well. Yeah, well, we had this mind when we were writing it. For the first one, we knew that if you want to make a goofy comedy, you better appeal to the teenage boys. 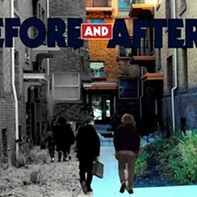 So, when we were making the new one, well, it’s a double-edged sword. You certainly want to make a movie that young kids would want to go see on its own. But you have to be true to the original. And you guys have grown up a little bit, you're a little bit older. I gotta ask this, and I’m sorry in advance, but do you consider Dumb & Dumberer canon? Urgh, that one hurt. We begged them to not do it. You know, a studio has the right to do that sort of thing, and they thought, "Hey wouldn't it be great if we did a prequel?!" And we were like, "No no no, please don't do that." What’s funny about these guys is they're grown men who don't know any better, they're little boys in men’s bodies. If you went back and showed them in high school, there’s nothing funny about that; there's a lot of kids that are as dumb as a post. So, we didn't have anything to do with that, and I wish it never happened. I actually never saw it. Will there be any appearances of past characters? The blind kid? Sea Bass? The cop that drank piss? Well, you hit two out of three. I’ll tell you that, by and large, it's a whole new story. The guys were kind of fighting over this girl Freida Felcher in the first one but you never saw her, so we bring her into play. Billy in 4C, the blind kid, he comes into play, and if you hang around till after the credits, you'll get to see our old friend Sea Bass.